Explore some of Italy's famous hiking trails with this 4-hour Cinque Terre hiking tour, including lunch. 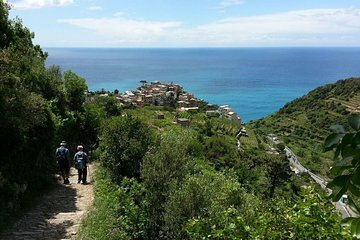 Burn calories on a Cinque Terre nature walk, and then enjoy fantastic views with a classic Mediterranean feast. Meet your guide in the village of Manarola wearing good walking shoes and bringing your camera – and your appetite. Walk down by the marina and along the seaside trail, stopping for photos as you go, and then ride the local minibus up the hill to the village of Volastra. Admire the increasingly wonderful views on the hilltop among the lemon trees, vineyards, and olive groves. This is where the hike begins. Take in stunning bird's eye views of the Cinque Terre, with terraces hillsides below and the sparkling blue sea in front of you. Hike for 1.5-2 hours to reach the village of Corniglia, the 'middle village' in the Cinque Terre. Enjoy a relaxed stroll through this picturesque town before sampling some of Liguria's best food products. Taste local pesto, olives, anchovies, focaccia, and sip some wine made in the Cinque Terre.